52 to 60 lbs. per cubic ft.
$4 to 56 per bd. ftdepending on thickness 95 cents per sq. ft.
slowly through your jointer and planer and to take light passes. 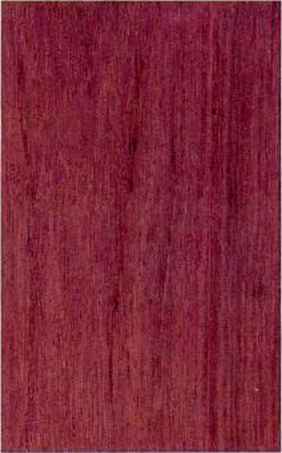 Purpleheart turns cleanly and easily with sharp tools, but it leaves a sticky resin on them, which must be cleaned off with alcohol occasionally. The wood glues well with aliphatic, polyurcthane and cyanoacrylate adhesives, and it sands easily. It can be polished to a high luster. The use of screws or other fasteners requires prcboring. Purplchcart steam bends moderately well. 1 Indicates wood movement across the gram from 6 to 12 percent moisture content.